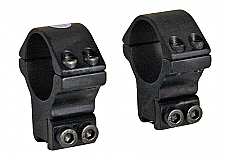 These mounts are designed to be used with all scopes that have a 30mm body tube and an objective up to 56 mm. These mounts are great with airguns as they have an integral recoil pin (used to prevent scope creep) built into the base of one of the mounts which can be pulled out with pliers for those who do not need to use this feature. The four screws on the split rings and two clamping screws on the side give a secure grip when used on guns with even the most punishing recoil. The BKL Model 301 a two piece set of mounts ideal for long scopes where you want to spread out the support along a long scope tube. The BKL-301is a sturdy double-strap set of rings good for all rifles and shooters. With plenty of clamping power and a self centering design this mount is must for the serious shooter. 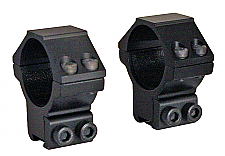 These Leapers mounts are designed to be used with all scopes that have a 30mm tube body and an objective up to 72 mm. They are great with airguns as they have an integral recoil pin (used to prevent scope creep) built into the base of one of the mounts, but the pin can be screwed up and out of the way for those who do not need to use this feature. Each ring has 4 screws to hold the scope firmly in place and the base has two heavy duty screws on the side to give a secure grip when used on guns with even the most punishing recoil. Don't let the price fool you. They are as heavy duty and as well built as any other mount available at higher prices. 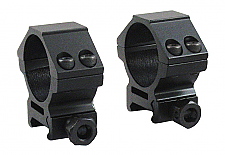 These Leapers mounts are designed to be used with all scopes that have a 30mm tube body and an objective up to 45 mm. They are great with airguns as they have an integral recoil pin (used to prevent scope creep) built into the base of one of the mounts, but the pin can be screwed up and out of the way for those who do not need to use this feature. Each ring has 4 screws to hold the scope firmly in place and the base has two heavy duty screws on the side to give a secure grip when used on guns with even the most punishing recoil. Don't let the price fool you. They are as heavy duty and as well built as any other mount available at higher prices. 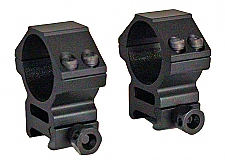 These Leapers mounts are designed to be used with all scopes that have a 30mm tube body and an objective up to 55 mm. They are great with airguns as they have an integral recoil pin (used to prevent scope creep) built into the base of one of the mounts, but the pin can be screwed up and out of the way for those who do not need to use this feature. Each ring has 4 screws to hold the scope firmly in place and the base has two heavy duty screws on the side to give a secure grip when used on guns with even the most punishing recoil. Don't let the price fool you. They are as heavy duty and as well built as any other mount available at higher prices. 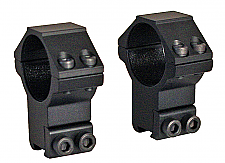 These Leapers mounts are designed to be used in conjunction with the Leapers Drooper mount base and with all scopes that have a 30mm tube body and an objective up to 40 mm. They are great with airguns as the Weaver base doesn't allow the mounts to slip and slide. Each ring has 4 screws to hold the scope firmly in place when used on guns with even the most punishing recoil. Don't let the price fool you. They are as heavy duty and as well built as other mount available at higher prices. 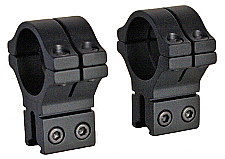 These Leapers mounts are designed to be used with all scopes that have a 30mm tube body. They are great with airguns that have Picatinny or Weaver scope rails. Each ring has 4 screws to hold the scope firmly in place and the base features a quick detach lever for attaching to any Picatinny or Weaver rail or dovetail. The tension on the quick detach lever can be adjusted tighter or looser as needed to give a secure grip when used on guns with even the most punishing recoil. Don't let the price fool you. They are as heavy duty and as well built as any other mount available at higher prices.